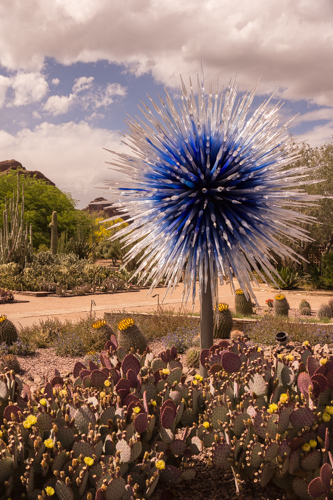 I love it when I can combine two of my favorite things; and yesterday it was the Desert Botanical Garden and Chihuly glass. 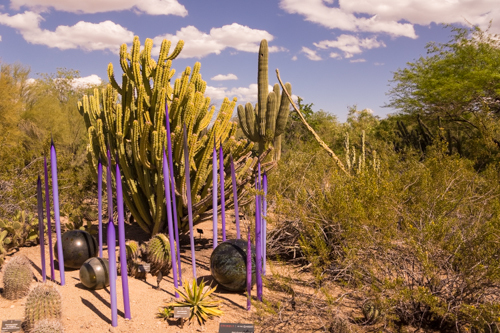 Located in Phoenix Arizona, the Desert Botanical Garden boasts over 55 acres of native plants, and for a limited time, 21 Dale Chihuly sculptures are also tucked into the landscape. This is the second Chihuly installation at the Desert Botanical Garden – there was also one in 2008 – but sadly I missed the first one. Charles first introduced me to Chihuly’s work over 20 years ago, and ever since I’ve been following his amazing progress as an artist. I remember seeing his outdoor installation at the Victoria and Albert in 2001, and I loved the reserved, (if not somewhat quizzical), British reaction to the almost phallic bright red glass reeds in their prim and proper courtyard. These reeds would become a mainstay in Chihuly installations, and today a striking lavender version appears at the Desert Botanical Garden. You know you’re in for something special the minute you spot the Sapphire Star at the entrance. This starburst figure is unique to this show, and the deep blue color is very eye-catching. Truthfully my favorite Chihuly piece — a Polyvitro Chandelier and Tower — was in the Sybil B. Harrington (no relation) Cactus and Succulent Gardens. A departure from the traditional chandelier, this piece has a unique metallic glaze, which makes the sculpture look like a cluster of colorful balloons. 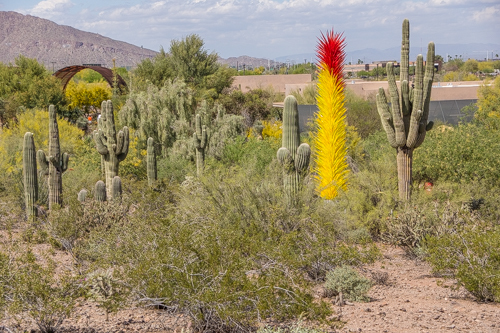 One of the most striking pieces – The Scarlet and Yellow Icicle — is located on the Sonoran Desert Loop Trail. Tucked into the landscape, it’s somewhat reminiscent of a yucca plant – albeit a very colorful one. 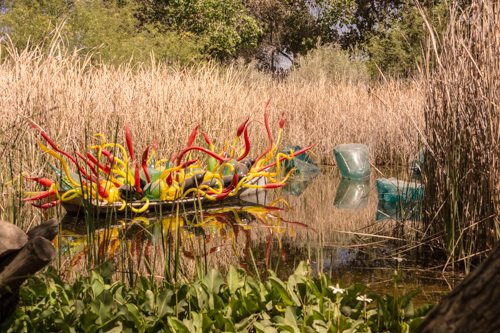 No Chihuly installation would be complete without a water sculpture, and in true fashion the artist included a very colorful Sonoran Boat among the reeds in a small garden pond. It’s truly a don’t-miss exhibition. The good news is, that it’s accessible to everyone. Scooters are available for rent at the entrance, and a good chunk of the installation is located along the Desert Discovery Loop Trail, which is paved and level. And although some folks may have problems with the slight incline of a few of the other trails, most of the Chihuly pieces can be seen from lower vantage points. All in all, it’s a very accessible garden, with plenty of spots to rest along the way. There was certainly no shortage of wheelers and slow walkers during my visit, which is always a good sign. The bottom line is, this Chihuly installation is a must-see; but don’t tarry as the exhibition closes on May 18, 2014. .Of course sometimes the artist gifts one piece to the host venue, but truthfully, you really want to see this installation in its entirety. 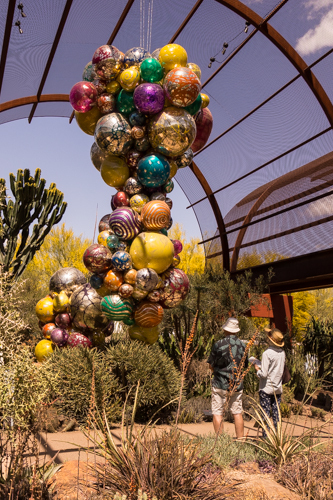 This entry was posted in Attractions, Destinations and tagged Arizona, chihuly, Dale Chihuly, Desert Botanical Garden, disabled, exhibition, glass, museum, phoenix, seniors, slow walkers, wheelchair, Wheelchair Accessible by Candy B. Harrington. Bookmark the permalink.